These basic pancakes are perfect for a weekend morning or holiday breakfast. Just pair with sausages or bacon and your favorite toppings for a well-rounded meal. The recipe is a tried-and-true favorite. You can even make a double batch and freeze them for breakfasts throughout the week! 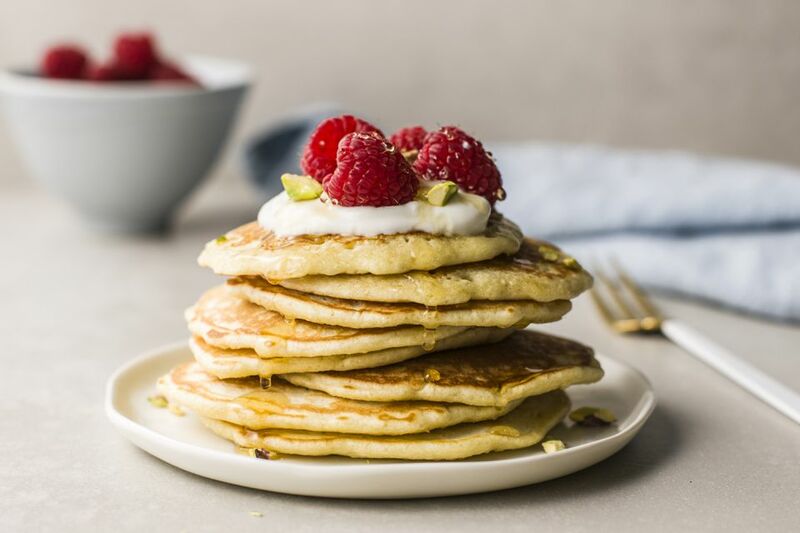 Serve these pancakes with plenty of butter and maple syrup, or use your own favorite syrup or fruits on them. In a bowl, combine the flour, baking powder, sugar, and salt. Whisk or stir to blend thoroughly. Add the egg-milk mixture to the flour mixture, stirring just until blended. Mix in the melted butter. If the batter seems too thick to spread, add a little more milk. Using about 1/4 cup of batter for each pancake, drop onto a hot, greased griddle. Cook until you see that the bubbles over the surface are breaking and the edges appear somewhat dry. Turn to brown the other side and finish cooking. If you are making several batches and want to serve them all at once, preheat the oven to 200 F before you begin. Place a rack on a large baking sheet and place it in the oven. Place cooked pancakes on the rack in a single layer (uncovered). The pancakes may be kept for up to 20 minutes in the warm oven. The batter can be made the night before. Just cover and refrigerate until the morning. If the batter seems too thick, add a little milk (a tablespoon at a time) until you have a good consistency. If you have a few leftover pancakes, freeze them in a freezer bag. Warm in the microwave, skillet, or toaster. For fluffier pancakes, separate the eggs and beat the whites until stiff. Make the batter with the yolks and fold the beaten egg whites into the batter last. To jazz up the flavor a bit, try adding a few teaspoons of orange zest to the batter. For spiced pancakes, add 1/2 teaspoon of cinnamon, 1/4 teaspoon of nutmeg, and 1/2 teaspoon of vanilla.